If it’s late winter, that means it’s nearly time for America’s mega-regatta. Sperry Charleston Race Week runs from Thursday, April 20 through Sunday, April 23 in Charleston, SC, and sailors in the Northeast are getting pumped to head south. Sperry Charleston Race Week has built a reputation as a keystone event, signifying the beginning of the spring sailing season. Part of the event’s popularity is due to the competitor-centric outlook that regatta organizers have long adopted. Each year, they make off-season tweaks to the event’s programming to ensure that Race Week is the best regatta possible for competitors. Among the refinements for 2017 will be the use of the Offshore Racing Congress rating system for all offshore entries (save those sailing one-design or in the Pursuit Class). Event Director Randy Draftz says he and his fellow organizers have done this to level the playing field for dissimilar boats as much as possible. “ORC is able to rate dissimilar boats more precisely because it uses a velocity prediction program,” he says. Another tweak will be the establishment of a fourth inshore racecourse to accommodate more classes and make sure that those groups are equitably distributed around Charleston Harbor. Draftz and company have a few other surprises in store. They’ll be importing Paul Henderson to enliven the event. Known as “The Pope of Sailing,” Henderson is the former head of the International Sailing Federation (for a decade), and a fierce advocate for grassroots sailing. He’s also a shrewd racing analyst and an engaging storyteller. Organizers have also partnered with the College of Charleston Sailing Program to offer US Sailing’s First Sail program. “We’ll be taking people out sailing who have never had that experience,” explains Draftz. “For us, it’s the perfect way to use the regatta to promote sailing to non-sailors. Ultimately, that’s what this event is about – promoting sailing.” He says that’s why he and his fellow organizers have adopted a new marketing tagline for Race Week this year: Serious racing. Serious fun. It’s the perfect way to start the spring season. 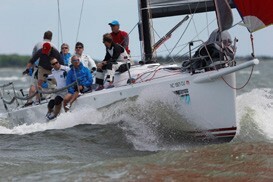 If you are interested in learning more about getting you and your crew to the event, please read A Sperry Charleston Race Week Primer and www.charlestonraceweek.com.